No they are not literally here in my hand, but many a people should be happy to learn that the Makita High Pressure Nailers and Compressor have made their way across the seas into the U.S of A. The benefits of using a high pressure nailer over a standard nailer are pretty obvious; the higher amount of air pressure allows the nailer to drive nails into the hardest of materials, like LVL and glue lam. To get you started, you will need a compressor. Makita's 2.5HP AC310H compressor offers 1.6 gallons of air packed to 400 PSI. Even though it can send all the pressure you need to you HP nailers, it also has two low pressure couplers for your standard nailers. For the nailers Makita has the 2-1/2” Siding Coil Nailer (AN610H) which weighs in at 4.2 lbs, and has a capacity of 400 nails ranging in sizes from 1-1/4” to 2-1/2”. Second is the 3-1/2” Framing Coil Nailer (AN911H) that weighs 5.3 lbs and has a 300 nail capacity ranging in sizes from 1-3/4” to 3-1/2” x .162” shank diameter. 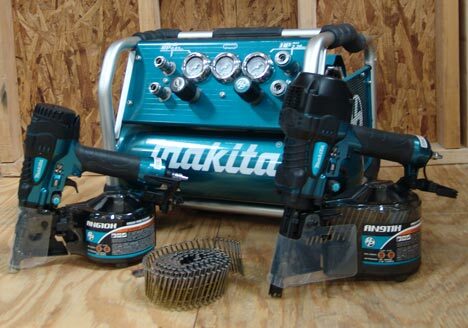 If high pressure nailers are on your list, be sure to check out the complete list of specs on the Makita website.